Ask any astronomer what nova means to them, and they’ll tell you it’s a “new star”. This is an entirely appropriate name for the Nova range of dental instruments, because they are set to become the new stars in surgeries across the world. They offer excellent quality at very competitive prices, driven by a commitment to craftsmanship and excellent service. “Nova insists on meticulous attention to detail and stringent quality assurance at every stage,” says Managing Director Karen Turner. “We invest in the latest technologies and systems and our team also works very closely with our European material suppliers for consistent standards.” The result is a range of instruments that are totally dependable, at prices that eliminate the need for dentists to look for cheaper, lesser quality alternatives. Nova offers dentists a wide variety of single and double-ended hand instruments, including explorers, carvers, scalers, instruments for composites, curettes, burnishers, measuring probes and pluggers. A choice of round, octagonal, silicone and resin handles is available. The Nova range also includes extraction forceps, elevators, tweezers, scissors, needle holders, clamps, hemostats and other instruments such as syringes and spatulas. Nova dental instruments are manufactured by Dentafix, the international experts in precision engineering, using only the highest quality stainless steels to ensure top performance and long life. The result is a product of outstanding quality, produced to several ISO standards. Dentafix, a member of the BDTA, has been producing dental and surgical instruments for private brands for over 25 years, and now crafts more than 30,000 instruments per month. The lifecycle of every instrument produced is nothing short of a fascinating metamorphosis. It starts with the delivery of the raw steel bars to the company’s Camberley manufacturing plant; these bars are routinely checked for quality and consistency. They then pass through various CNC milling and turning machines – systems that are all programmed in-house – before being passed on for assembling and finishing. Somewhat surprisingly in a world where automation is the norm, this is performed by craftsmen, some of whom have been with the company for over 20 years. Such is their level of skill, it is these same craftsmen who in the days before the intorduction of CNC machines would have been responsible for creating every instrument by hand from scratch. The final stages involve annealing heat treatment, hardness testing, ultrasonic washing and laser marking, before being placed – again by hand – in any one of a wide variety of custom-designed boxes or blister packs. The Nova instrument range is a truly global brand. As well as being available within the UK, the range is also available via an exclusive dealer network in every continent. With its team of trained craftsmen, quality materials, wide range, competitive prices and increasing global profile, there is a very bright future ahead with Nova! Close tolerance automated machining and controlled heat treatment of working ends gives prolonged life. Flexibility and extremely sharp tips ensure excellent ‘feel’ during use. Colour-coded with black markings using a combination of accurate automated manufacturing and skilled craftsmanship. Composite restorative materials are often notoriously difficult to place and their sticky nature means they frequently adhere to the instrument rather than the prepared tooth, especially if the instrument has become scratched. Nova, the specialist in dental instruments, has the solution – a range of instruments specifically designed for use with composite materials. The tips of Nova’s composite instruments feature a special Titanium Nitride coating. This creates an ultra-smooth surface that is highly resistant to sticking and scratching, helping ensure composite materials can be quickly placed and carved. Nova Periodontal instruments include scalers, curettes and miscellaneous instruments. Nova scaler and curette working ends are manufactured from specially selected high grade material; complex and precise heat treatment processes ensure that cutting edges remain sharp under repeated use. Nova extraction forceps are manufactured from surgical grade stainless steel with a hinged joint to ensure optimum distribution of forces along the instrument. They are available in most common American, English and European patterns. If you are unable to find the forceps that you require in our online catalogue, we will be pleased to provide you with a quotation upon request. Which forceps should you choose? 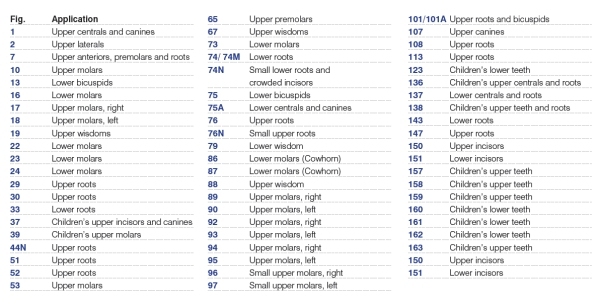 The diagram shows which forceps are best for extracting teeth – for an adult on the left and a child on the right. 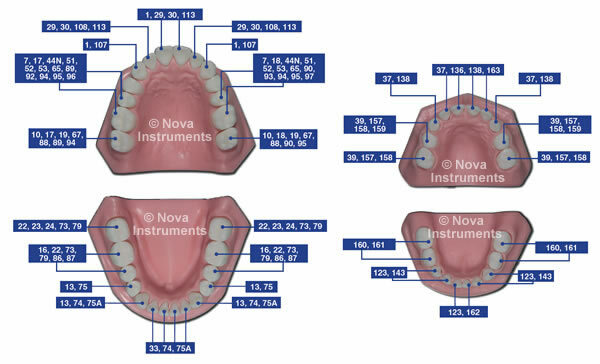 Nova can provide virtually every dental instrument you require. Our miscellaneous instruments include needle holders, artery forceps, tweezers, knives, spatulas, syringes, impression trays, pliers and other instruments.